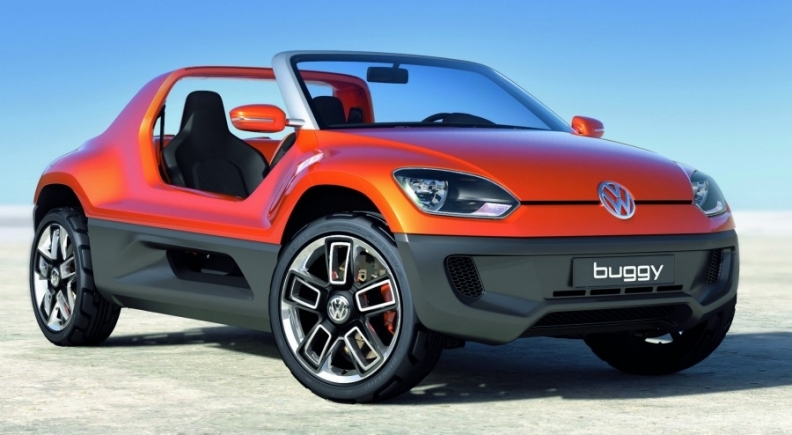 Volkswagen unveiled the Buggy Up, based on the Up minicar, at the 2011 Frankfurt auto show. FRANKFURT -- Volkswagen plans to add two SUVs positioned below the Tiguan compact model because of booming demand for such vehicles, a newspaper report said. The launch of a subcompact SUV and a smaller model based on the new Up minicar is "certain," German business publication Handelsblatt reported on Monday, citing company sources. VW had planned to build a subcompact SUV based on the Suzuki SX4. It was to be called the Rockton, according to some media reports, but the ending of the VW-Suzuki alliance killed the project. Now VW will base the model on the Polo, Handelsblatt said. VW has shown an SUV concept based on the Up and called the Buggy Up at recent auto shows and the company says it has been well received. Albrecht Reimold, head of VW Skovakia, which builds the Up, told Handelsblatt that the minicar's lineup will be expanded with new variants but declined to discuss specific details about an SUV version. "It's certainly an area we must look at," he said. Handelsblatt said an Up SUV would be sold for well under 20,000 euros. Later this year, Opel/Vauxhall will launch the Mokka, the first subcompact SUV from a German automaker. Opel is targeting annual sales of 50,000 units. French brand Peugeot plans to join the segment next year with the launch of a SUV-styled crossover based on its new 208 compact. In 2011, more than 200,000 subcompact SUVs and SUV-styled crossovers were sold in Europe. Market analysts IHS Automotive estimates that the sector will grow to 500,000 annual sales by 2018.